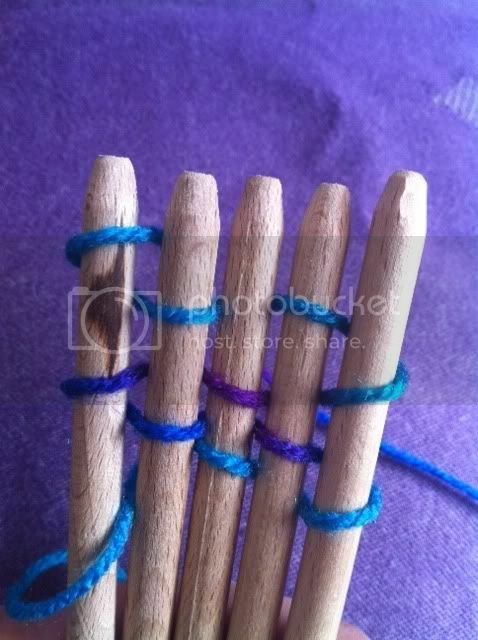 After posting yesterday's brooch, a few friends have asked me how to go about stick weaving. I should make it clear that I was only shown how to do this at the weekend by a weaver from Fire & Fibre at Unravel so I really don't know any more than that, but it's very straightforward and if you want to give it a try and have no one to demo it for you, here is what I was shown. 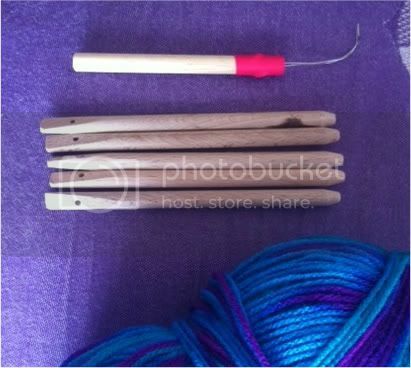 It's probably easier to start with two sticks to get the feel for it (I made yesterday's brooch using two sticks), but for this project I'd like a wider weaving, so I'm using all 5 sticks - the method is entirely the same however many sticks you use. 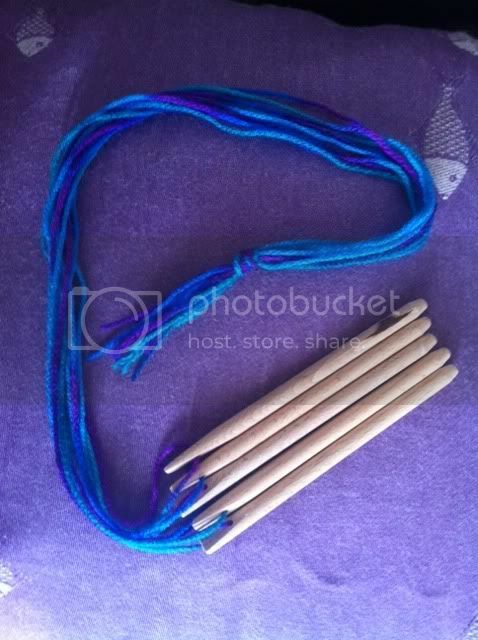 - A set of weaving sticks appropriate for the width of the piece you'd like to weave. I have this set. 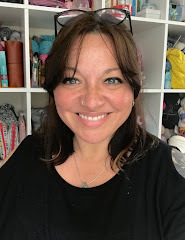 - Yarn or string for the warp - this should be strong enough for the intended item - eg if making a belt or bag handles, it will need to be more sturdy than if making a decorative item that will not be weight-bearing. 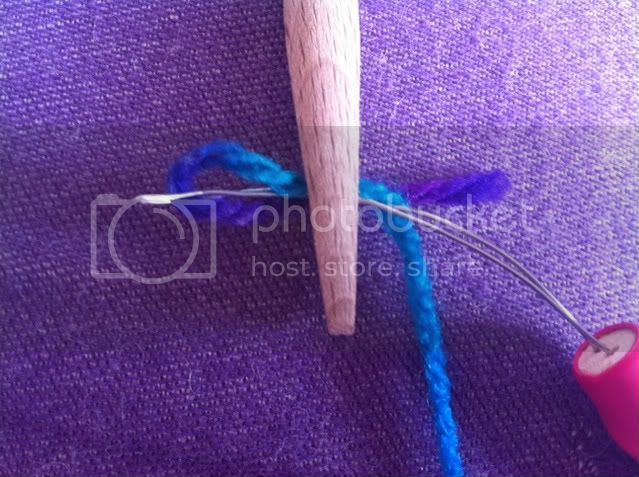 - A "threader" to get the warp through the small holes (mine came with the sticks). - Something to weave with - I am using left-over yarn but you can use strips of fabric or anything else that you can wind between the sticks. 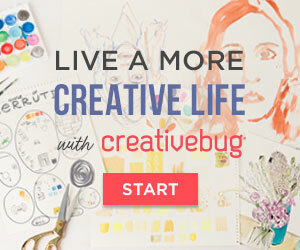 - Anything (tapestry needle, buttons etc) you will need to make the weaving into something else when finished. ....and tie them together at the bottom. 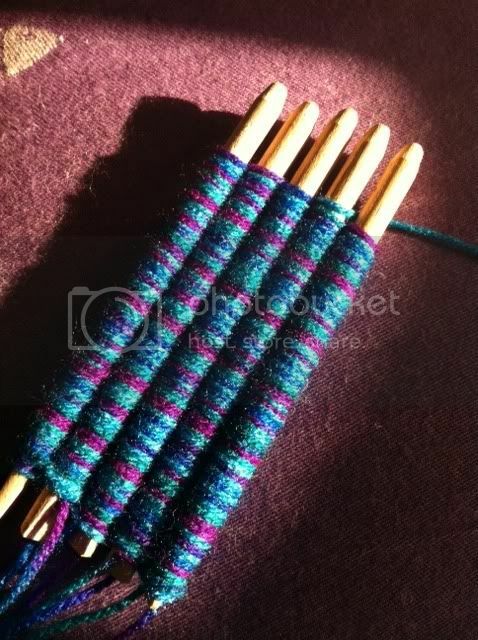 Hold the sticks in your left hand and the weft yarn in your right if right-handed (reverse if left-handed), leave a tail and start weaving around the sticks in a figure of eight. .....when the sticks are almost full, gently wiggle each stick up so that part of it is on the warp and part still on the sticks and continue this process until the weaving is the desired length.